Troop 628 leads the presentation of colors! 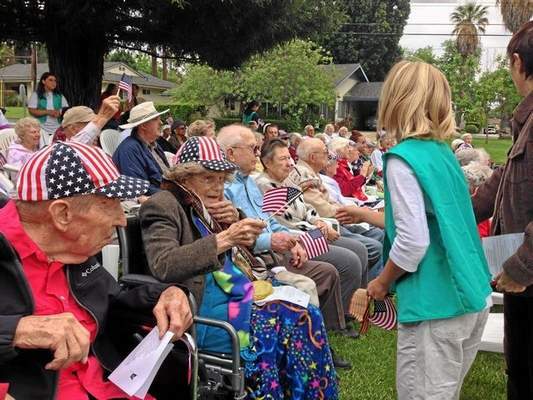 Plymouth Village in Redlands held its second annual flag lowering ceremony on Friday, May 23, 2014, as a precursor to Memorial Day events planned across the country. We were happy to learn that Girl Scout Troop 628 paid respect to our veterans by leading the presentation of colors. The girls also gave veterans and the spouses of veterans small American flags as tokens of thanks for their service. This information was provided by the Redlands Daily Facts writer Kristina Hernandez. Previous Previous post: Girl Scouts ban “bossy” at Cal State San Bernardino!